Saint Raphael School families with children in grades K-8 are required to participate in PTA Fundraising. All monies raised benefit our children and Saint Raphael School community . Each family must produce a profit of $250.00 for the school. The Saint Raphael School PTA conducts various fundraisers throughout the year. Below is a list of examples of the PTA Fundraising events/programs which can be used to meet this obligation. If the $250.00 is not met, families will be invoiced for the difference. Families who DO NOT wish to participate in any fundraisers, may choose a Buyout Option. Buyout cost is $250.00 per family. Please understand that you will still receive all the fundraising fliers, but do NOT feel obligated to participate in them. Please complete the SAINT RAPHAEL SCHOOL PTA Buyout Form and return to Main Office, Attn: PTA. Checks should be made payable to SRS PTA . The PTA participates in the Box Top Education Program. 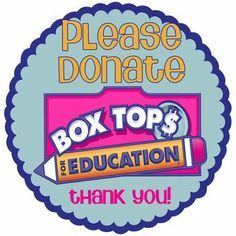 Saint Raphael School receives $0.10 for each box top you submit. Ten cents may not sound like a lot, but it adds up quickly! The program is simple and easy. Cut the box tops from participating brands and send the box tops in an envelope or Ziploc bag with your child’s name and grade. The PTA conducts several Box Top classroom contests throughout the school year. The winning classroom can earn a class party, dress-down day, or prize. Box Tops can be found on hundreds of products by popular brands such as: General Mills, Yoplait, Lysol, Ziploc, Green Giant, Hefty, Fiber One, Annie’s, Nature Valley and many more!